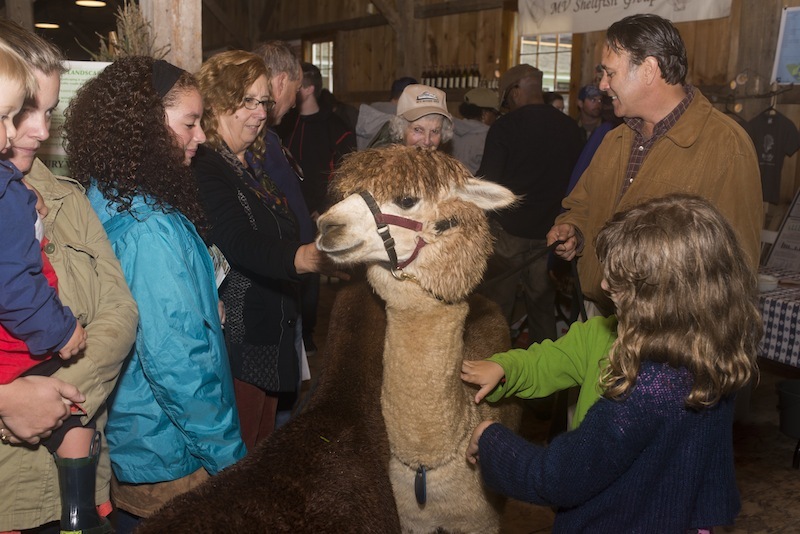 Even alpacas have fun at the harvest festival. The fair in August may be the busiest event of the year for the Martha’s Vineyard Agricultural Society, but Saturday’s Living Local Harvest Festival stands out for hosting the largest number of activities in a single day. Part expo, part music fest, part symposium, and all about the Island, the free festival at the Agricultural Hall in West Tisbury runs from 10 a.m. to 4 p.m. on Sept. 23, followed at 6 p.m. by a community supper prepared by the Scottish Bakehouse ($18 over age 5) and a 7 p.m. contra dance with the Flying Elbows fiddle band. Now in its 18th year, the sustainability-oriented festival appeals to all ages with a mix of education and pure fun. Family offerings include animals, arts and crafts, face painting, field games, hay rides and the chance to watch pumpkins hurled far across a pasture by the modern-day version of a medieval trebuchet. Local food vendors include Morning Glory Farm, The Larder, Kitchen Porch, Taco Loco and Not Your Sugar Mamas. More than 30 Island organizations are staffing booths, including the Martha’s Vineyard Fisherman’s Preservation Trust demonstrating how to filet a fish. In the front room of the hall, a series of locals present “mini-guides” to other traditional skills such as fermentation, worm composting, making your own cleaning products and raising backyard chickens. Panel discussions with Island experts delve into the food equity movement on Martha’s Vineyard and reducing the use of plastics to keep them out of the environment. The music tent showcases Island performers throughout the day, from young singer-songwriters to bluegrass and blues. Tristan Israel and Paul Thurlow play inside the hall during the community supper. A complete schedule is online at livinglocalmv.org. The theme of the 17th annual Living Local Harvest Festival was reduce, reuse, recycle.